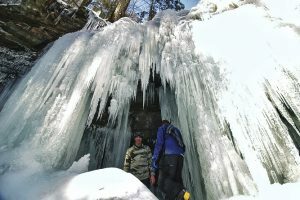 On the cold morning of January twenty-second, seven intrepid climbers departed to hike up the frozen valley basin of Ricketts Glen. Prepared with ice axes, poles, ropes, and crampons, we began the journey along a stream. The muffled sound of the creek under a thick blanket of ice accompanied us all the way up the valley. The landscape was a veritable palace of mirrors with the dazzling sun bouncing off the prisms of ice found on any surface of the area, even the sides of trees. With the murmuring creek whispering along our path, we marched closer to our goal. 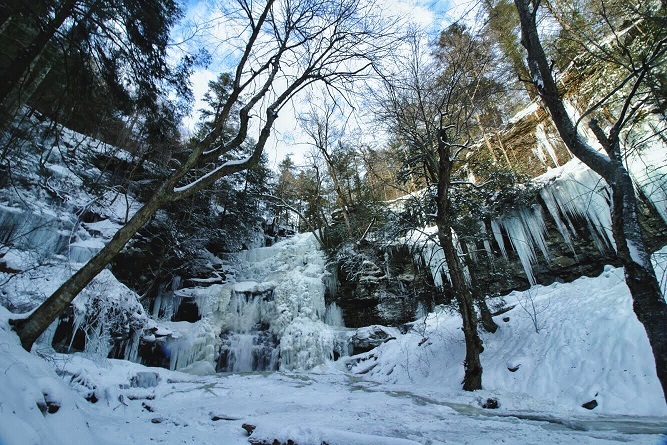 The sides of the creek were ornamented with the most transparent icicles I had ever seen, being born from the pure mountain water, they gave the hike an indescribable amount of beauty. As we approached the first water fall it was found to be completely solid, and as thick as the walls of a castle. As we had no time for delay, we moved on. The next waterfall evaded the petrification of its lower peer and defiantly gushed a stream of water above it’s frosty peak. The glass-like structure of the ice that did form around it made it easy to watch the torrential pulse of water flow underneath its rock-hard skin. After a few more waterfalls and a lunch break, we ascended the highest slope. The claws of our crampons gave the vital grip needed to clasp the frozen trail. Any mistake would be disastrous. The buried creek stopped it’s whispering and began to roar as we passed a grove of snow-capped trees, and there appeared the goal of our expedition; the mighty ninety-foot waterfall. It was an impressive tower of ice with a turbulent flow of water coming down the middle of it. The valley walls protecting this tower were protected by spears of ice longer than three standing men. Each icicle had their protruding fangs reach down menacingly towards the snowy basin. Finally, we reached the top. To give ourselves a sense of fearlessness for the New Year, we decided to go down the cliff by rope and harness. Tied in securely to a tree as old as the waterfall, one after another went down. It was a game of balance and concentration, having to make sure not to sway too close to the waterfall and get sucked into its bitterly cold torrent, and not to get tangled in the trees protruding from the cliff side. It was surely a victory over fear for all of us. Now, nothing seems too hard to overcome this twenty nineteen for those that hiked up the valley of ice.